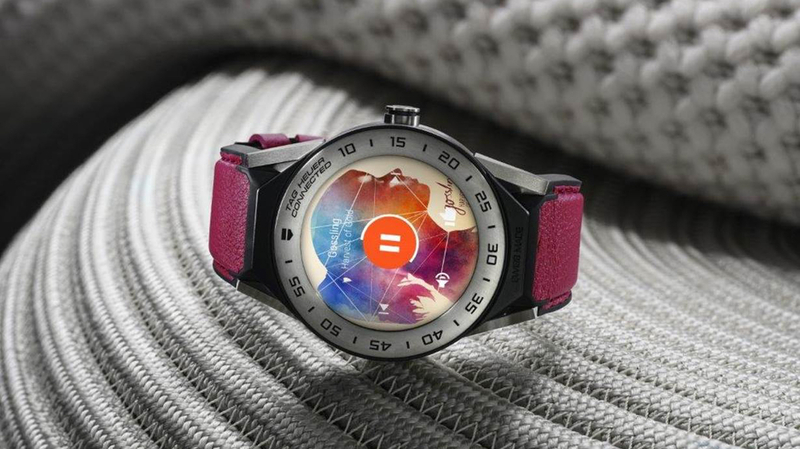 Tag Heuer has announced the Connected Modular 41 smartwatch, the long-promised, smaller version of last year's Connected Modular 45. The 45 is a damn fine Android Wear smartwatch indeed but the fact that, until now, it only came in the 45mm size meant those with smaller wrists, particularly women, weren't being accommodated. CEO Jean-Claude Biver said there would be a 39mm version in the future, and while the 41 is a tad larger than than what was promised, it's still a respectable step-down in diameter. Tag has made some improvements to the display and guts of the watch too. It now has a 326ppi, 390 x 390 AMOLED display - up from the 45's still-respectable 287ppi. The smaller watch also gets 8GB of storage and 1GB of RAM - double the 45's on both accounts - while still being water resistant to 50 meters and including built-in GPS and NFC for Android Pay. 8GB of storage is particularly pleasing - Android Wear watches usually come with a standard 4GB, so there's plenty more room for storing your music and apps with the Modular 41. Modularity is Tag's unique premise on these watches and the 41 comes in seven base options with a variety of lugs and straps to swap in, including new pink, blue, and white leather band options. The Connected core can even be replaced for a Calibre 5 mechanical module, which is perfect for anyone who might not want to wear a smartwatch 24/7 but doesn't want to skimp on luxury. Pricing for the Modular 41 starts at £1,000, the same as the larger variety. We expect you'll be able to run that much higher, however; a Deluxe package 45 costs £14,500. So yeah, this one's aimed proudly at the luxury market. It's available to order right now. But we really liked the Connected 45. In his review, Wareable editor Mike Sawh said: "There's still room for improvement, but overall, Tag's second attempt proves that this is one Swiss watchmaker that's learning very quickly how to make a good smartwatch." With the new Modular 41, it proves it's continuing to learn still.